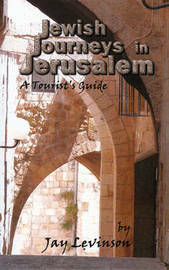 Jewish Journeys in Jerusalem: A Tourist's Guide is a travel guide designed to give tourists a Jewish experience when visiting the city. The book covers interesting background about popular sites and fascinating details about lesser-known places. How was the Talmudic era grave of Nicanor found? Which places give the best views of the Temple Mount? Where can you walk on the roof of the Old City? How did the Geula neighborhood get its name? Whether this is your first trip to Jerusalem or one of many, this book is bound to greatly enhance your understanding and appreciation of the city. Jay Levinson, after retiring from the Israel Police, has published many books and articles about his numerous travels. He has written extensively about Jewish sites and history, and is well acquainted with Jerusalem, where he has lived for over twenty-five years. Levinson holds a Ph.D. in Near Eastern Studies from New York University and is currently an adjunct professor at John Jay College.